There's nothing more unsettling than having your baby be uncomfortable and in pain while teething. Having the right tools on hand is really important. I've always loved the teethers by Nuby and one of our newest is their IcyBite Keys. I got the set that comes with convenient wipes to safely clean them whether you're home or on-the-go. Teething is a tricky time and some babies need cold to help numb their gums and soothe their pain. The Nuby IcyBite Keys can be placed in the fridge where the liquid inside can become cold enough to last and help numb baby's gums. There are multiple surfaces for baby to chew on so there's always a cold surface available. These keys come in Perfectly Pink (pictured) and multi-color. 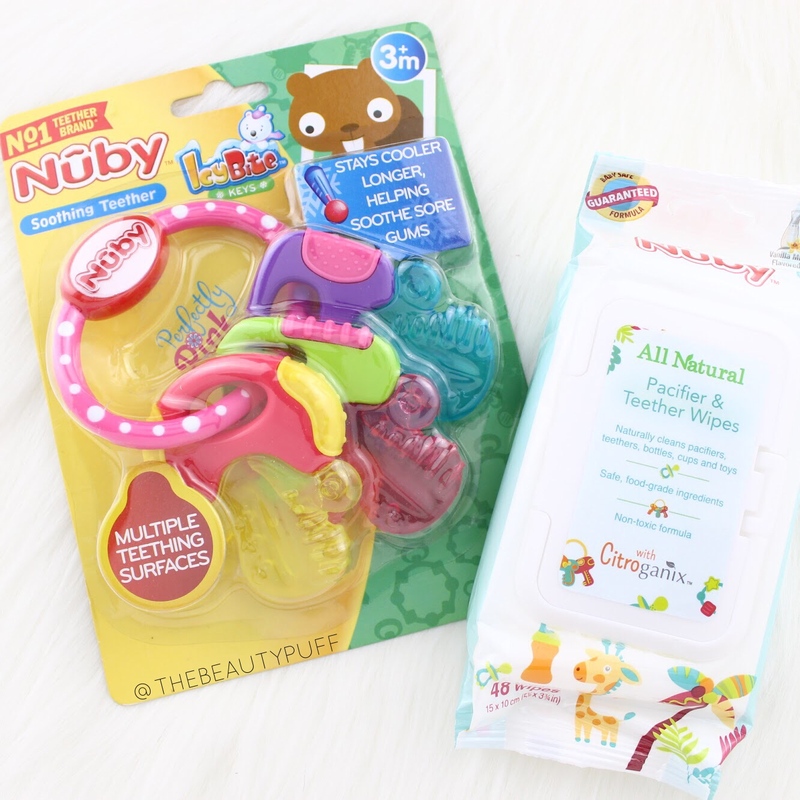 When it's time to rotate teethers, the Nuby All Natural Pacifier and Teether Wipes are really convenient! Babies put everything in their mouths so it's really important to be able to keep their teethers clean and ready to go. These wipes are as convenient as baby wipes so you can just throw them in your purse or diaper bag and you're set! Each pack contains 48 wipes so you'll be set for a while without having to refill too often.